This document was jointly developed by the Assessment Work Group (AWG) and researchers from the RAND Corporation's Assessment Finder project. Its purpose is to provide school and district leaders and implementation teams with guidance on how to choose and use social and emotional learning (SEL) competency assessments. It discusses the benefits and challenges of measuring SEL competencies, what to consider when choosing an SEL competency assessment, and guidance for using SEL competency data in practice. The information found here serves as a complement to two online resources: The AWG's SEL Assessment Guide offers guidance to educators on how to select and use assessments of students' SEL competencies, specifically interpersonal and intrapersonal knowledge, skills, attitudes, and mindsets. The Guide focuses on measures currently used in practice and will expand over time as more are nominated. The RAND Assessment Finder lists more than 200 assessments of interpersonal, intrapersonal, and higher-order cognitive competencies. 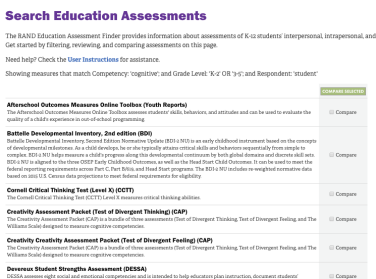 The Assessment Finder enables practitioners, researchers, and policymakers to explore what assessments are available and obtain key information about what they are designed to measure, how they operate, what demands they place on students and teachers, and what kinds of uses their scores support.